V euve Clicquot has launched a new award to celebrate emerging female talent and encourage greater collaboration within the entrepreneurial community. The �New Generation Award� will recognise the success and vision of one female entrepreneur between the age of 25 and 35. The winner will reflect the core attributes that Madame Clicquot exhibited in her formative years, such as a fearless approach and innovative thinking to achieve her goals. The call for nominations for the �New Generation Award�, alongside the 41st Veuve Clicquot Business Woman Award act as the starting point in the search for the best female business talent in the UK. This will result in two exceptional women being awarded at a prestigious ceremony in London on 22 April 2013 at Claridge�s Hotel, London. Regarded as the �Oscar� of female entrepreneurs and business leaders, the Veuve Clicquot Business Woman Award is a tribute to Madame Clicquot, the legendary founder of Veuve Clicquot. Created in 1972 as a tribute to Madame Clicquot, the annual Veuve Clicquot Business Woman Award champions the success of business women and female entrepreneurs worldwide who share the same qualities as Madame Clicquot: Her enterprising spirit, her courage and the determination necessary to accomplish her aims. "As one of the most celebrated female entrepreneurs, Madame Clicquot was an innovator within her field and also demonstrated bravery which enabled her to triumph in a period of uncertainty," said Elsa Corbineau, Director of Champagnes, Moet Hennessy UK. "In today�s economic climate, it is even more important to recognise the contribution that women make to business life and through the development of intergenerational entrepreneurial communities they can support young talent. Allowing young women realise their business potential is why we have launched the New Generation Award alongside the established Business Woman Award." The winner of the 40th annual award in 2012 was entrepreneur Anya Hindmarch and the winner of the 39th annual award was Michelle McDowell MBE, Chair, Civil and Structural Engineering at BDP. Drawing upon her natural passion for accessories and design, Anya started her business at the age of 19. Since then, she has spearheaded the business growth from her first retail outlet, an intimate first floor shop on London�s Walton Street, to fifty seven shops worldwide, including a London flagship on Sloane Street and a Tokyo flagship in Aoyama, with a New York flagship opening in the New Year. 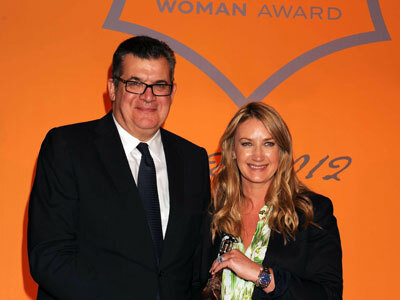 In 2009, Anya Hindmarch was awarded an MBE in recognition of her contribution to the British fashion industry. Two years later in 2011, she became a UK Trade Ambassador as well as becoming a Non-Executive Director of the British Fashion Council. She is also a trustee of both The Royal Academy and The Design Museum and a Governor of The University of The Arts. Her support of the next generation of British entrepreneurs, most notably through the Government�s �Start Up Britain� campaign was also cited by the judges as a key reason as to why she was awarded the prestigious accolade. Anya�s commitment to be a socially responsibly business was also welcomed by the judging panel, most notably for the charity promotion, �Be a Bag� project and her ability to inspire change by making it fashionable not to use plastic bags with her iconic �I�m Not A Plastic Bag� campaign, launched in 2007. Also noteworthy was her 2009 launch of Anya Hindmarch Bespoke. This launch was perfectly timed as consumers increasingly sought investment pieces that were unique, beautifully crafted and personalised. The Bespoke collection is for both men and women and allows customers to personalise their pieces with hand written messages and drawings that are embossed into the leather by Craftsman based in the Pont Street store. "It is the greatest honour to win the Veuve Clicquot Business Woman award in it's 40th year, " said Anya on receiving her Award. "It is a very real compliment to be deemed to share some of the qualities of Veuve Clicquot herself who was clearly a brave and pioneering woman but also to even be considered amongst my fellow finalists, Helena Morrissey and Ruth Rogers who are both brilliant businesswomen and lovely people."